Bryan Thompson trains people to reach people who can't (or prefer not to) read with the Gospel. By focusing on personal interactions and telling stories rather than pointing to books, he's able to to share God's love in ways that people understand. But don't think that it's shallow because he's telling stories. Far from being a “step away” from the Bible, it models the way Jesus taught. And it can quickly become a deep discussion about God and life because of the way questions allow Bryan and others to dig into God's word. 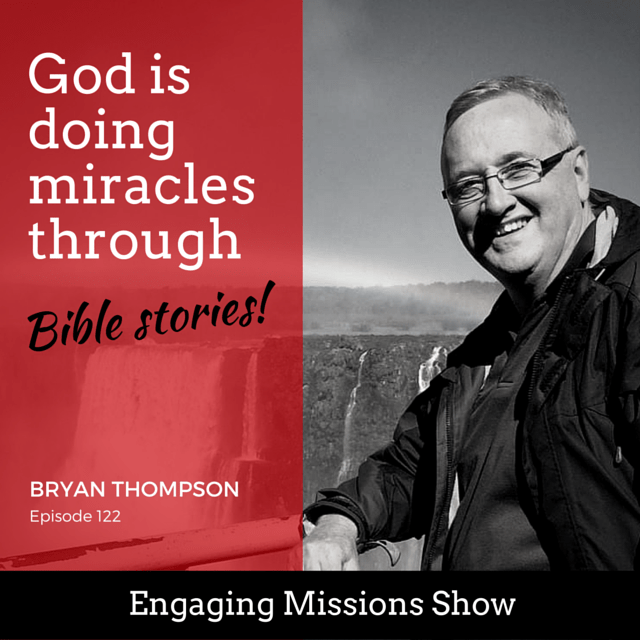 Listen as he shares some of the wonderful things God has done through his ministry. [05:26] – How is your family involved in ministry? [17:30] – What is orality? [25:30] – How did God lead you to this? [34:47] – What fuels your passion? If this is true, this is going to affect the rest of my life. My commitment to Christ was also my commitment to missions. God is doing miracles through Bible stories. The last words Jesus gave us was to go. The God Story – The order form is near the bottom of the page. I found the part about Mary and Martha interesting. I associate with Martha. I tend to think that God NEEDS me to DO things for Him and I forget that He can accomplish things without my help. He’s more interested in my heart and the motives for my service than in the number of things I accomplish for Him. I also forget that I am to DO things WITH Him. He wants me to follow Him and He wants to be apart of all aspects of my life. I can’t earn His favor by the things I DO. He loves me for me and He wants to spend time with me. Yeah, that’s so hard to keep in perspective. Or at least it is for me. Thanks TC for your comment. Really discovering what that “one thing that is necessary” that Jesus mentions in this story, and holding it before us always, is really vital. ?